This maiden is an Asynjur, one of the goddesses of Asgard. She is a goddess who looks and acts very much human, but, who has a golden voice. Her song is to be said to part the clouds and ride the breezes over the oceans to warriors who were out at sea. Only a "true warrior" is said to hear her golden song among the storms and rough waves of the sea. It is said that her song can smooth the roughest waters and is the reason that the seas calm so suddenly during such storms. 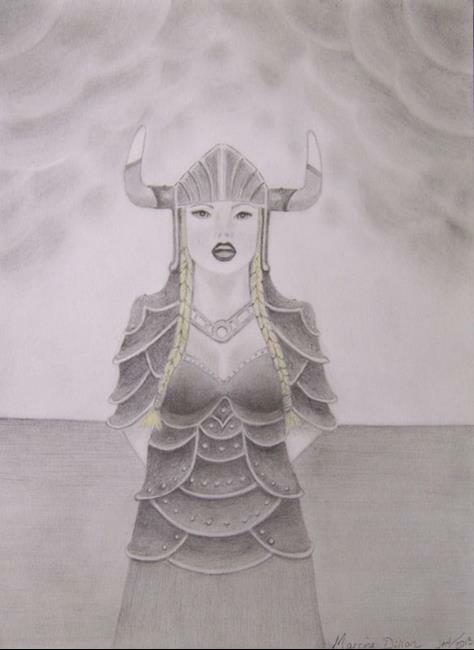 This is the first "Norse/Viking" themed piece that I've done...I was inspired to do so by the "Norse Mythology" themed exhibit for this month. She is drawn with graphite pencil and using yellow prismacolor for her braids. Hope that you enjoy her as much as I did drawing her!